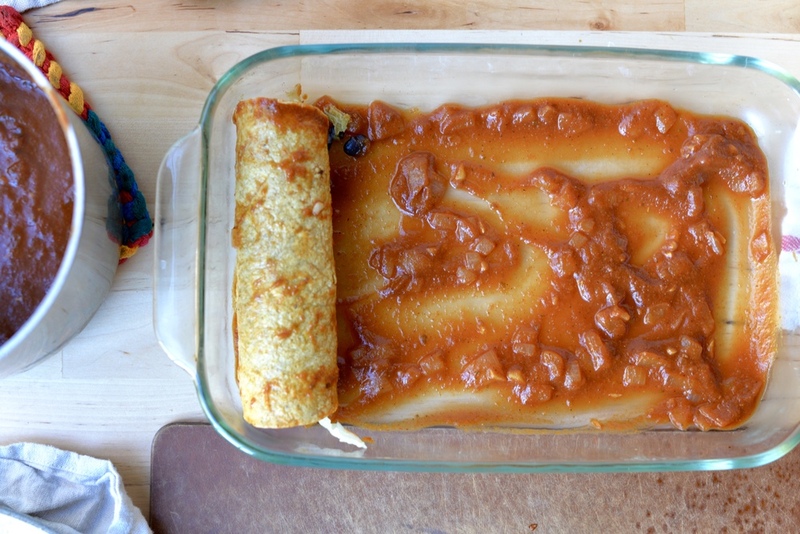 Enchilada casserole is one of my fiance's favorite things that I make. So, I thought that making one of his favorite things would be a nice way to celebrate the fact that we are only 6 months away from our wedding! Only 6 months! It sort of seems like a long time until I think about how October has just sort of flown by and Christmas is just around the corner and 2016 is almost here. Yowzers. Before I work myself up about it all and get all excited about the fun little party we are going to have come April, I will move on with this recipe. In addition to my fiance loving enchilada casserole, I love the chicken enchiladas from our neighborhood Mexican restaurant that are only available at brunch. 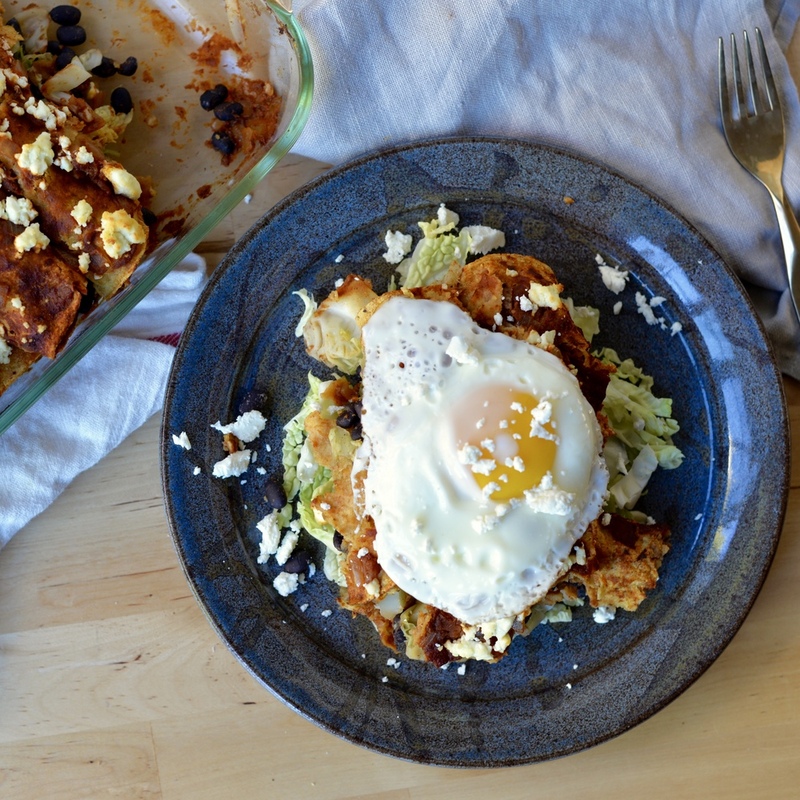 I took a few liberties with my enchiladas, but two things I did borrow from them was the sunny-side egg draped over the tortillas and the little bed of lightly dressed green cabbage lounging beneath. 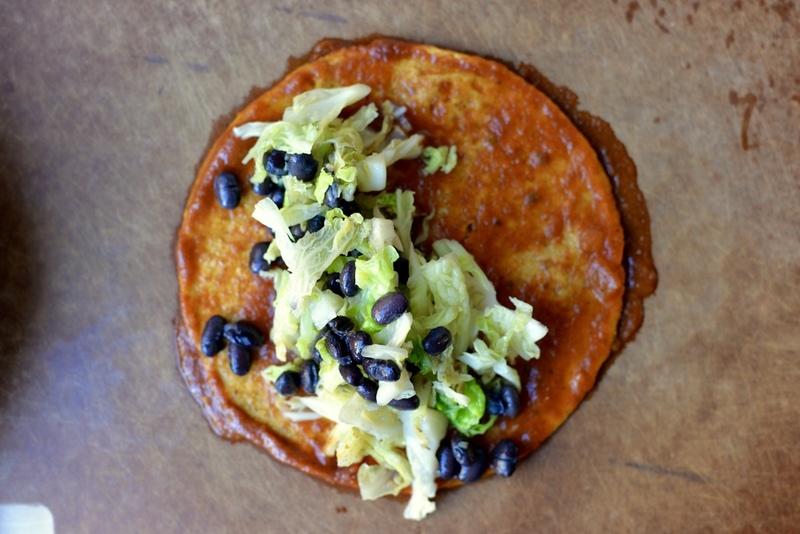 The oozy egg makes the whole thing look sophisticated when Mexican food can look a little less than, and the cool, crisp cabbage just begins to wilt under the heat and heft of the enchiladas to still provide a nice little crunch. 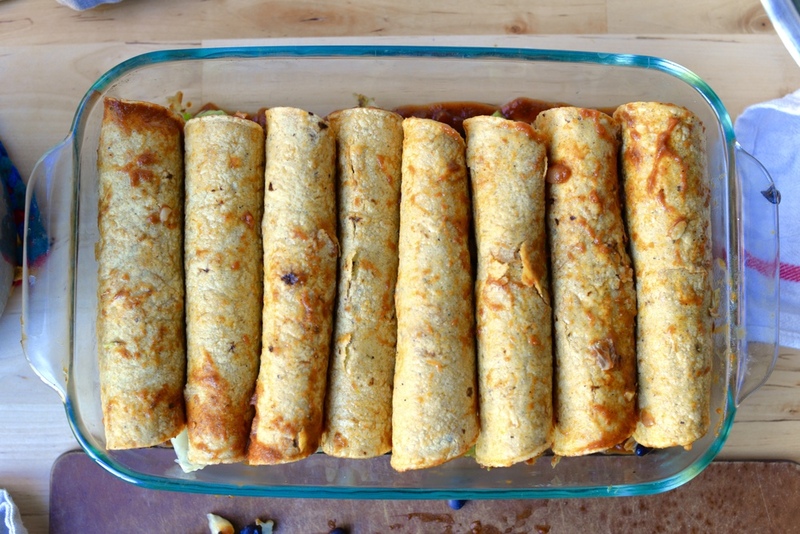 I keep these enchiladas vegetarian, stuffing them with sauteed green cabbage- a vitamin C booster-and fiber-rich black beans. I use a tangy goat cheese crumbled on top compared to the salty cotija used at the Mexican restaurant and it does make it a little extra fancy, but I also thing it provides a creaminess that is just so yummy. And another way I sneak in some vegetables? I throw some canned pumpkin and ground coriander into my favorite Mexican Spiced Tomato Sauce. It is barely noticeable, but it does give the sauce a bit more body. I also happen to think that pumpkin and goat cheese make a splendid combination. 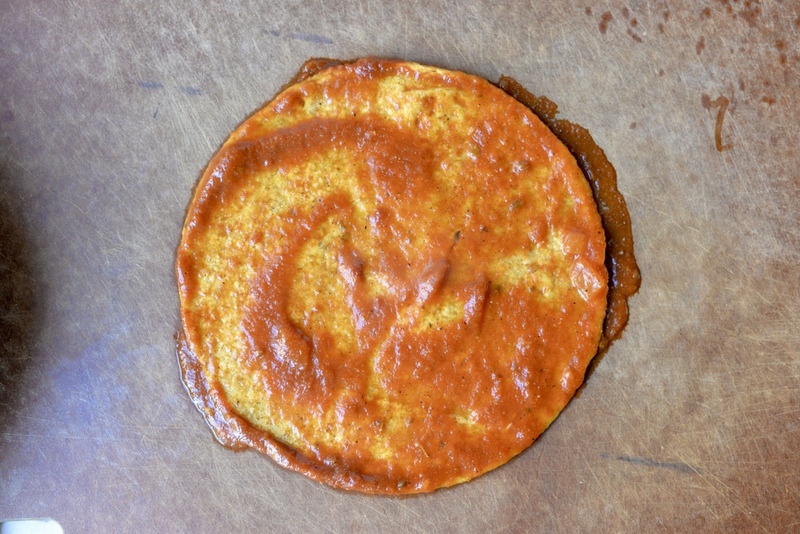 Pumpkin can be so earthy and grounding that the goat cheese lightens it up. Of course, fresh cilantro would really make this dish sing, but I kept forgetting to buy it from the store. 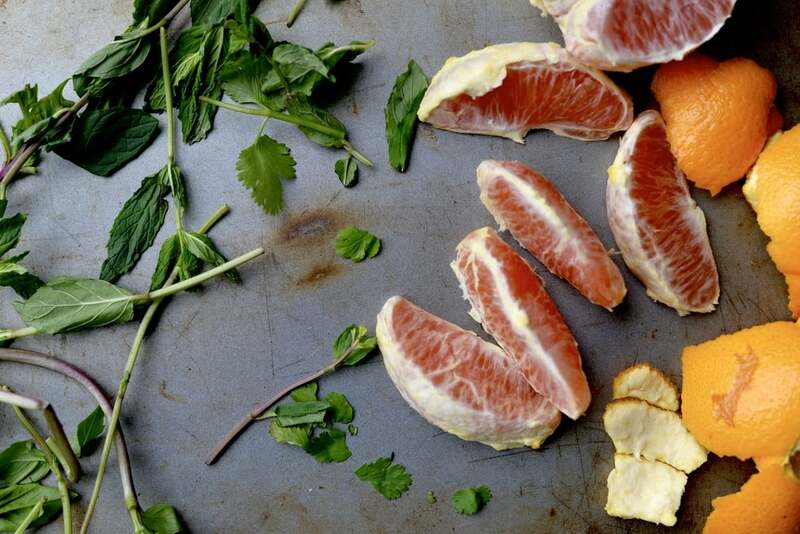 This is a favorite dish for leftovers- if you have any! I cannot guarantee that the enchiladas will scoop out perfectly out of the casserole dish as the tortillas get a bit soft, but if you choose to go the egg route, it covers up the mess you make quite nicely. Either way you scoop it, the flavors all work. That I can guarantee. Prepare sauce. In a medium saucepan, heat oil over medium-high heat. Add onion and garlic cloves, and cook for 5-8 minutes or until softened and slightly golden. Add chili powder, cumin, oregano, ground coriander, and salt, and stir and cook for 30 seconds or until fragrant. Add canned pumpkin and tomato sauce and water. Stir to incorporate and turn heat to low and cook for 20 minutes. Season to taste with salt and pepper. Preheat oven to 400 degrees Fahrenheit. Saute cabbage. Heat 1 tablespoon olive oil over medium-high heat. Add all but a heaping cup of shredded cabbage to the pan and pinch of salt. Saute until wilted but not soggy, about 5-8 minutes, stirring often. 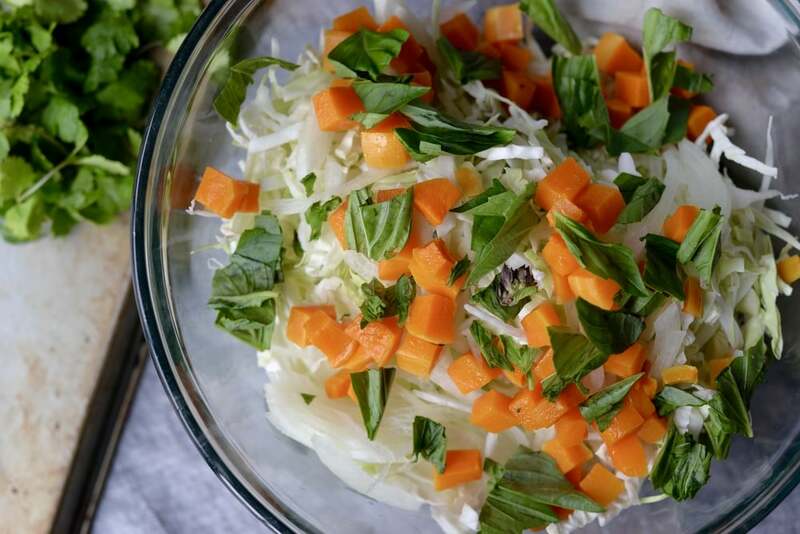 Add black beans, 1/2 of crumbled goat cheese, and shredded sharp cheddar to warm cabbage and stir until combined. Season filling with salt and pepper as necessary. Assemble enchiladas. Spread a thin layer of sauce on bottom of 8x13-inch baking dish. Dip corn tortilla in sauce, allowing excess to drip off. Tortilla should become pliable. Lay flat on cutting board, spoon a scant 1/4 cup of filling into tortilla, and roll up. Place seam side down in pan. Continue with remaining filling and tortillas until all are snuggled into the pan. 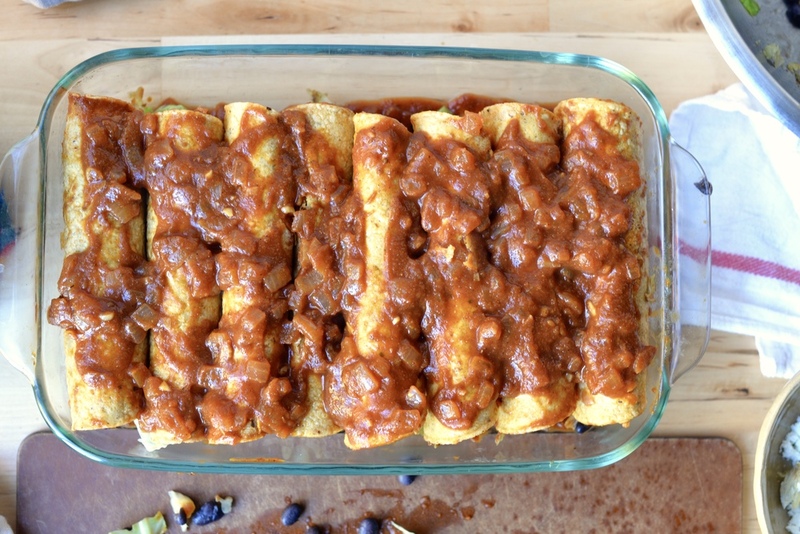 You will have extra enchilada sauce leftover. Spread a bit of remaining sauce on top of tortillas just so prevent drying out, especially on the tortilla edges. Sprinkle remaining goat cheese on top and place in the oven. Bake for 20-25 minutes or until cheese gets a little golden. Remove from oven, allow to rest for 5-10 minutes before serving. 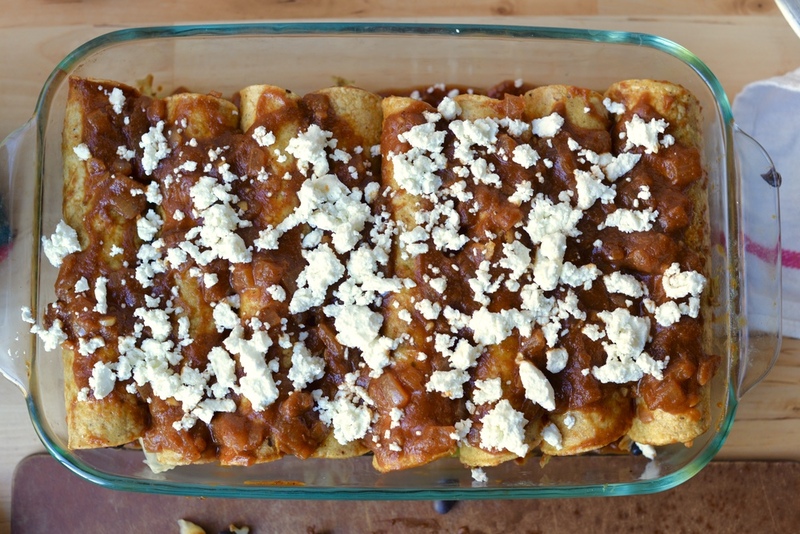 Place a little bed of the remaining cabbage on each plate, serve enchiladas on top, and drape an egg cooked to your liking over it all. Sprinkle with extra cheese if desired. Enjoy! Serves 4. *To cook eggs over-easy, heat a little oil in a non-stick or cast-iron pan (about 1-2 teaspoons of oil per egg- I like to use ghee for the flavor). When hot (water should sizzle when splashed on it), crack egg into pan, sprinkle with a little salt and pepper, and place a lid over top (that does not touch egg surface) and turn down the heat to medium/ medium-low. I have a clear pot lid that I use to make visibility easy. When eggs have reached desired doneness (this takes about 3-5 minutes for me to get whites cooked but yolks still just a little runny but thick), remove from skillet and serve.